Overshadowed by sprawling Babylon to the northwest, Riveria was the city of the working class. Babylon was glitz and glamor and gold; Riveria was factories and smokestacks and processing plants. The manufacturing and commercial heart of the nation, Riveria was steeped in blue-collar honesty and mercantile hospitality. Yet, like Babylon, it too was a city cobbled together from smaller settlements. Generations ago, when Babylon was young, and men still remembered the terror of the Long Night that reshaped the world and dragged it off to an unknown universe, this place was called Three Rivers. Named for the three rivers that fed into the sea, all within walking distance of each other, it had begun life as a fishing town. Over the decades, as neighboring villages and settlements expanded and merged, Three Rivers transformed into the city of Riveria. But to Connor, here, this place, would always be Three Rivers. 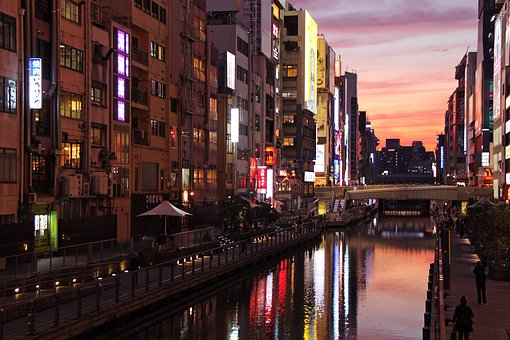 Connor and Yamamoto sauntered across the Shinbashi Bridge, the wide concrete bridge that joined the districts of Shinsekai and Three Rivers across the Black River. Under the soft amber glow of the light poles, the evening crowd flowed into Three Rivers. Couples out on a stroll, families huddled together, groups of young men and women looking for action and entertainment and more. Holograms danced across the glass and concrete faces of the buildings across the river, advertising energy drinks and beer and perfume and food. Squadrons of drones buzzed overhead. Down the river, a tourist boat slowly wound downstream, the manic voice of a tour guide cutting through the night. This was nostalgic. Connor had crossed the bridge both ways countless times in his youth. The waters, the skylines, the tourist boat, they were still here. But the signboards had changed, the holograms were new, and when he looked closer he saw a thousand different subtle deviations from the images in his memory. He had lived in Babylon for too long. But then, he never had a reason to return to Three Rivers. Not until now. Connor and Yamamoto stayed close, keeping within an arm’s breadth of each other. At least, Connor tried. Yamamoto slipped through the gaps in the crowd like an eel, twisting and turning and sliding and pivoting, almost but not quite touching the people around him. Connor had no idea how he did it. Connor imitated his team leader as best as he could, careful to avoid jostling the people around him. Where he couldn’t, he angled his body at the last moment, preventing them from touching his torso and backpack. The rest of the team were scattered across the city, with with their areas of responsibility. Tonight it was just Connor and Yamamoto in Three Rivers. And the cops. They ran into their first RPD checkpoint on the other side of the bridge. Two uniformed RPD officers in tactical vests and ballcaps stood guard with carbines in hand, one guy watching the bridge, the other covering his back. Neither of them keyed on Yamamoto and Connor as they passed. Three Rivers was home to Riveria’s thriving nightlife scene. Everywhere Connor looked was a nonstop assault on the senses. Restaurants and bars and dance clubs lined the roads, their signs drowning the world in harsh neon. Music blared from every direction, competing with the holographic advertisements and the buzz of the crowd. Old-fashioned road cars oozed slowly down narrow streets while gravcars swooped past overhead. Signs pointed to shopping arcades and local landmarks. Delicious odors wafted from food carts. Touts, some human, some robots, called out to passers-by, enticing them with special offers and discounts and promotions. Hidden in an alley, nestled between a bar and a convenience store, was a small fenced-off area. Long strands of knotted hemp rope adorned the fence. Past the fence was a small shrine housing a stone statue. The statue depicted a man with a long staff in his left hand and prayer beads clutched in his right. A red cap rested on his head, and a small red cloak covered his torso. Yamamoto fished around his pockets, produced a large coin, and dropped it into the shrine’s offertory box. He backed up one step, and bowed twice, long and low and deep. He clapped twice, pressed his palms together, and stayed still for a long moment. He bowed again, and stepped back. “Are you a believer?” Connor asked. They melted back into the evening crowd. Undercover patrol wasn’t Connor’s strong suit. Sure, he could ghost into the crowd if the mission called for it, but his blood yearned for a clean, straight-up, uncomplicated fight. A fight where he could put his talents to good use. Soon, he knew. Once the local PSB had their target deck, it would be time to rock and roll. Connor took the lead. This was his city, his neighborhood, and Yamamoto deferred to his superior knowledge. The southern section of Three Rivers was one huge shopping arcade, interspaced with office buildings and food courts and a small park in its heart. Connor waded through the crowd, taking in the sights and sounds and smells. A pair of high schoolers, still in their uniforms, holding hands and strolling down the boulevard. A family of five exiting a restaurant, the mother holding a toddler, the father pushing a baby stroller, a little girl clinging close to her father. A kebab seller calling out to the crowd, competing with a nearby ice cream cart and sandwich vending machine. Delivery drones streaked past overhead, ducking into or flying out of stores through specially-designed slots, beeping cheerily at passers-by. To civilians and outsiders, it was just another night in Three Rivers. But Connor felt the tension in the air. It was in the way they sped from place to place, almost as if they were running; the lack of people strolling and window shopping or dawdling; the slowly thinning crowd. That wasn’t the Three Rivers he remembered. The cops were out in force. Police bots slowly orbited the arcades or watched from rooftop perches. Teams of cops and K-9s walked their beat, the crowd parting magically before them. Heavily-armed and armored SWAT officers manned checkpoints out on the streets. Here and there, the police stopped and searched citizens seemingly at random. They didn’t stop Connor or Yamamoto though. Before executing the mission, the Black Watch deconflicted with RPD and the PSB field office, and planned their patrol routes and checkpoints together. The RPD knew that there were undercover STS operators in the area, but not necessarily what they looked like. Just in case, Connor had his badge ready in his breast pocket. The cops aside, there was another reason the people were edgy. The believers were coming out to play. As darkness fell, a new breed of street animal flooded the arcades. Handsome men and beautiful women in scant skintight clothing sold trinkets, handed out pamphlets and testified to the wonders of the Liberation doctrine. Others adorned in bright robes and shimmering tattoos aggressively approached passers-by, guiding them to Pantheon-owned businesses. Connor had seen them all before. They had been a part of the landscape since he was a kid. Hell, he even recognized a couple of the older devotees. They’d been working these streets for decades, and they didn’t seem to have aged. Not much, anyway. But now there was a new group in town. They wore no uniform, but dressed uniformly in black and blue and red. Jackets and archaic cloaks for men, delicate headdresses and corsets and long skirts or tight pants for women. All of them carried themselves with confidence and grace; all of them could have earned top billing in movies and magazines and dramas through their looks alone. They were short and tall, white and yellow and brown, but their skins were pale, their bodies lithe, and their eyes glowed a subtle shade of red. They were the Court of Shadows. The Liberated, the Pantheon and the Shadows stayed well clear of each other. The old guard went above and beyond, pretending the vampires didn’t exist. They didn’t talk to the Shadows, they didn’t come close, they didn’t even look at them. Not much more than a quick glance to confirm their location, perhaps an extra second to fire a dirty look, then a return to arrogant indifference. The Shadows didn’t play by the old rules. As Connor passed them by, the vampires nudged each other and laughed at the other two factions. In loud voices, they denigrated the Liberated as hedonistic children, and the Pantheon as confused and old-fashioned. Their targets continued to ignore them. For now. They weren’t doing anything wrong, but they were waltzing right up to the line. Connor didn’t care either way. If it were up to him, he’d dump every last believer in the New Gods on a desert island and let them kill each other, then massacre whoever was left. Let the New Gods fight it out among themselves and leave everybody else alone. Connor slowed down, taking his time to soak in the new atmosphere, watching all three sides. The Pantheon composed themselves with dignity, while the Liberated maintained their carefree attitudes. The Shadows continued their dissing, to no avail. He saw no weapons, but Elect didn’t need guns to wage war. Ripples passed through the crowd. Drums boomed and flutes trilled. People hastened to make way. Connor turned. A procession of Pantheon priests marched down the boulevard. Eight strapping men carried a massive palanquin, their bright orange robes exposing their muscular arms. Seated atop the litter was a huge blue-skinned woman. She wore a necklace of skulls draped over her neck, the dirty white contrasting with her black lamellar armor. Black and red stripes arced across a high-cheeked face dusted in white powder. Curved fangs jutted from her mouth, framing a wicked smile, her long, sinous tongue dangling to greeting the world. She had nine heads. One main one, eight smaller ones fanning out in a circle. Every head boasted three wide open eyes that glared out to the world. Her hair was a wreath of flames that crowned every head. A dozen arms spread away from her body, all of them carrying swords and staves and tridents and bows. Her legs, long and muscular, were crossed in a lotus position. Beside and behind the palanquin, a band of musicians played a blood-maddening tune, banging their drums and playing their flutes to a score only they knew. The litter-bearers raised their voices in song, singing in a language Connor didn’t recognize. A crowd of citizens trailed the litter, some of them singing too. Connor scanned the crowd. Devotees of the Pantheon, costumed or in plain dress, clapped their hands in prayer and bowed low. The Liberated maintained a respectful silence and distance. The Court glanced at the goddess and continued whatever they were doing, though some did step aside to make room. “Was there a procession scheduled today?” Connor whispered. Per city regulations, organizations had to file for a permit with the authorities before they could hold a march, rally or any other public event. In practice, the New Gods never bothered. It wasn’t as if mortal authorities could touch them. And at least they stayed out of trouble. But that was before rise of the Court. As the procession advanced, the shopping arcade cleared out. This was the first time Connor had seen so much empty space in the arcade. Everybody could read the signs: things were going down, and nobody wanted to be caught in the crossfire. The procession spilled out of the arcade and into the streets. Cars honked. Drones chirped. Nobody cared. The priests marched at their own pace, and the devotees followed their lead. Connor and Yamamoto worked their way into the crowd, getting as close to the palanquin as they dared. This close to the drums, Connor’s covert earpieces kicked in, muting the sound. But they couldn’t do anything about the bass booms reverberating in his chest. The procession snaked down the streets, cutting across avenues and thoroughfares with total disregard to traffic laws and vehicular traffic. The priests steadily made their way southwest, cutting through the residential district at the heart of Three Rivers. As they passed, apartment windows lit up, people retreated into stores, vehicles backed up or paused or blew their horns. More people joined the crowd, and when Connor looked behind him, he saw a mass of humanity that stretched from one of the road to the other, packed so tightly not even Yamamoto could slide through them. Connor slid in next to Yamamoto. “We’re going to have a problem,” Connor whispered. “What?” Yamamoto asked, raising his voice to be heard. As Connor monitored the procession, Yamamoto switched frequencies and updated the RPD on his radio. The only police presence Connor saw was a lonely drone flying overhead, following the palanquin. “What’s the word?” Connor asked. Up ahead, four cops manned a checkpoint at an intersection. All four cops stepped aside and let the palanquin passed. Connor sighed, just loudly enough for Yamamoto to hear. “We’re in Court turf now,” Connor said. “Head on a swivel,” Yamamoto replied. The procession continued. The streets narrowed. The litter bearers sped up, and citizens surged in to fill the gaps. Connor found himself lagging behind. With gentle nudges and touches, he navigated through the crowd, but there were more and more people, streaming in from every direction, so many it was like the sea, a force of nature all by itself, inexorably carrying him away from the priests, away from Yamamoto. The procession flowed onwards, still oblivious. Murmurs and whispers floated from a hundred mouths around him. A voice cut through the night. Connor craned his neck. But all he saw were people, more people, and that enormous effigy of the goddess. “I’m moving in,” Connor whispered. The operators cut through the crowd, endlessly reciting “Excuse me” as they shoved and slipped and brushed past. Connor tilted his head, looked in every direction, but he couldn’t see anything. But he heard the buzzing of a rotors. He glanced up. A squadron of drones popped out of alleys and above rooftops, converging on the crowd. The bulky drones were painted night-black, taking care to stay out of the light as much as they could. They were all carrying small payloads, but Connor couldn’t tell what they were. As Connor approached the palanquin, the voices of the priests became clearer. Horrendous shrieks issued from a dozen throats. Men and women and children screamed and ran. Connor bit back an oath, held his arms out in front of him like a spear and charged into the crowd, deflecting the panicked people with solid bone. “HA!” a chorus of men shouted. As one, the litter-bearers set their load down. Connor kept his head down and plunged deeper into the crowd, rushing for the front. The statue of the Destroyer raised herself to her full height, towering over the crowd. Her ten heads fanned out to face in every direction. Her arms swung around, pointing her many weapons down the street and into the air. And the world ended in light. If a brutal-yet-realistic dungeon crawler is right up your alley, check out the Kickstarter of Dungeon Samurai here.